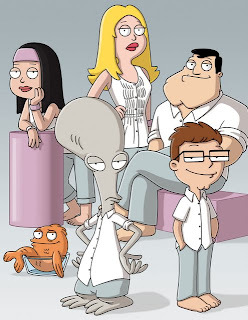 When it comes to Fox’s most recent American Dad! 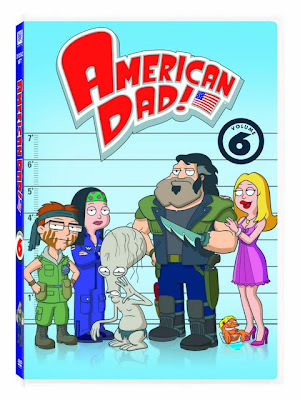 release, don’t let the number “6” on the box fool you to the real numbers this three-disc set contains as Dad Volume 6 boasts all eighteen episodes of Seth MacFarlane’s smash series, which aired over the course of the fifth season. And fittingly – unlike other volumes that begin at random halfway into each annual installment – this one adheres to the sitcom playbook by starting strong and finishing on a high note, kicking off the first disc (and simultaneously season five) with three hilarious episodes that rank among the show’s best. 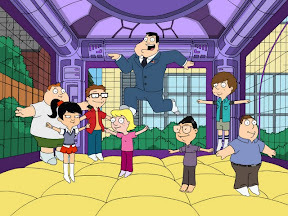 Whereas MacFarlane’s pop-culturally referential Family Guy often moves from one contemporary send-up or timely skit to the next -- in a technique that unfortunately may give the jokes a short shelf-life in the future – American Dad! is much more classically plot-driven as a family sitcom. Yet by blending together the two styles to offer a best-of-both-worlds plotline, Dad ’s debut episode “In Country...Club” marries Guy’s rapid-fire movie spoof wit with Dad style suburban absurdity to riotous effect as Stan and Steve enlist in the country club’s Vietnam war reenactment complete with a soundtrack of CCR and Jefferson Airplane and homage to the final speeches and scenes of Rambo and Platoon . 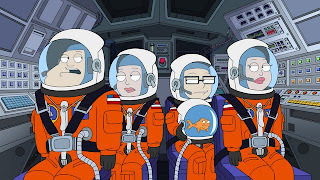 Though Dad’s Francine fares infinitely better than her Family Guy counterpart, ultimately for both series’ animated mothers and (especially) their blandly written daughters, a good plot is hard to find for the female characters on the two otherwise wonderfully witty shows. Yet this being said, in one of the season’s silliest but strangely believable turns of events, a surprisingly soapy subplot develops surrounding Hayley’s escalating flirtation with Reginald, the undercover koala voiced as though he's the Barry White of cartoon bears that's landed on Dad after escaping from a '70s cop show. 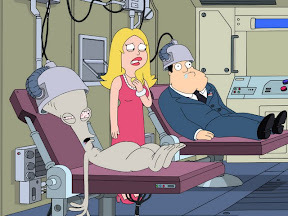 Nonetheless, given the writers’ knack for playing against the character’s surface-level angelic looks that enable her to say/do the most ridiculous things with the most hysterical of results and without the slightest risk of affecting her likability, in the end it’s Francine that remains American Dad ’s most underrated weapon of hilarity. The go-to Gal Friday for great guffaws that by sheer proximity amazingly even allows us to tolerate Roger right up until that point when he inevitably crosses the line into unbearable creepiness, while she doesn’t control the narrative on the level of her husband, Francine is the heart of some terrific Volume 6 tales. 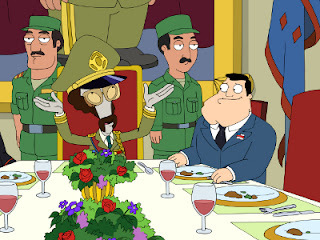 As such, she keeps her husband in line throughout whether she’s torn between the present-day Stan that takes her for granted and the cyborg version of the eponymous American Dad from the future who arrives complete with a Mexican/Canadian hybrid accent or when she decides to go off her beauty regimen to teach her husband a lesson about inner-beauty. Of course, Dad is at its best when no one is left by the wayside, from the former East German Olympian turned pet fish Klaus who asks Hayley for a Ryan Phillippe haircut to the show’s most valuable supporting players like Patrick Stewart who never fails to get a laugh as Stan’s boss at the C.I.A., which we discover in the fifth season finale is now under corporate sponsorship by Chia Pet . 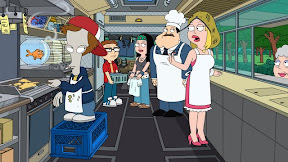 And despite a few midseason Roger-related stumbling blocks that resulted in a feeling of déjà vu as the writers were forced to keep upping the ante of outlandish gags, when the right balance of creative alien antics and offbeat arcs coincide, Dad gets back on track. 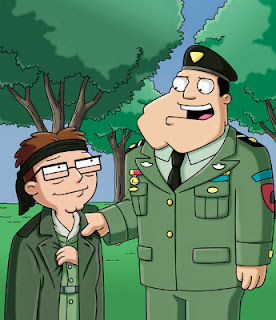 From Roger’s decision to become a dirty cop just minutes on the force to a President Reagan approved Lord of the Rings inspired journey to rewrite Olympic history, Dad Volume 6 is filled with enough dynamic creativity to give Family Guy a run for MacFarlane's funny money.